It seems cruelly ironic that the latest mass killing in America happened at a school named for Marjory Stoneman Douglas, who dedicated herself to improving lives. Cruel and ironic, but then, what do we expect? The shooting spree at Marjory Stoneman Douglas High School occurred on day 45 of the year 2018--day 45 of the new year, Valentine's Day, in fact, but already the 18th school shooting of the year. In other words, during 2018, we have experienced one school shooting every 60 hours. Put in still other terms, we have a school shooting every 2.5 days. And that's "only" counting school shootings. There have already been 30 mass shootings in 2018. And we are only in the 7th week of the year. For this year's statistics, check out the Gun Violence Archive--there have been 6,621 "incidents" involving gun violence this year in the United States, resulting in 1,835 deaths. On Day 45 of 2018. But today, instead of focusing on young, angry, white men, often with ties to white nationalism, who commit the majority of these atrocities, I thought I'd focus instead on some other aspect of their crimes. Was that just avoidance? If so, the time I spent answering my question was not time ill-spent. Born in Minneapolis, Minnesota, on 7 April 1890, Marjory Stoneman would later recall an incident from her early childhood that was a sign of the course her life would take. She said that when she was five years old, her father read Longfellow's The Song of Hiawatha to her. When Hiawatha commanded a birch tree to give him its bark so that he could make a canoe, she broke into "loud sobs," asking her father "why should the birch tree have to give up his bark just because Hiawatha wanted to build a canoe?" "I couldn't stand it," she said. (I also love her reflections on her lost childhood copy of Alice in Wonderland: "Some fiend in human form must have borrowed it and not brought it back.") Reflecting on her memory about Hiawatha, she later concluded that it was her "first really independent thought." Stoneman's parents divorced not long after. her father moving to Florida while Stoneman and her mother headed to Taunton, Massachusetts, where they would live with her mother's family. Life with her mother's family was difficult--her mother's mental health was unstable, and the family criticized Stoneman's father for his unsuccessful business ventures. About this period in her childhood, Stoneman concluded that the "dislocation" of her life "made me something of a skeptic and a dissenter." But she loved her education, begun at Barnam Street Elementary. Stoneman noted that, because employment opportunities were so limited for women in the 1890s, she had excellent (female) teachers and instruction. "There wasn't much that literate women could do except teach school," she observed, "maybe that accounted for the wonderful teaching we had." By the age of sixteen, she had also begun her writing career, receiving a Gold Badge from St. Nicholas Magazine for her contribution in the category of "puzzle-making." Her puzzle was, as she described it, "Double the Headings and Curtailings." Just six months later, in June 1907, she was awarded a junior writing prize by the Boston Herald for her short story, "An Early Morning Paddle," about a young boy on a camping trip who paddles out to the middle of a late one morning in order to watch the sun rise. By 1908, Stoneman had graduated high school and enrolled in Wellesley College, where she would major in English. She graduated four years later, in 1912, the same year as her mother's death. Although she had a college degree, Stoneman found that there were still few employment opportunities for the educated woman, and so she enrolled in a training program that would qualify her to teach salesgirls and do a bit of "personnel work." She finished the course, which enabled her to take a job at a department store in St. Louis, where her job was "to make out sales slips and to teach the cash girls some grammar." If one of these "girls" ran into trouble, Stoneman was also supposed "to straighten her out." After a few months, she moved on to Bamberger's department store in Newark, where she became the "educational director"--though, as she notes, "why department stores had educational directors I never really understood." Lonely and drifting aimlessly, Stoneman met Kenneth Douglas, a tall, thin, good-looking man who was an "ordinary dresser with good manners"--as she describes him--and thirty years older than she was. Within three months of their first meeting, on 18 April 1914, they were married. Marjory Stoneman, now Marjory Stoneman Douglas, does not shy away from telling about her disastrous marriage in her autobiographical Voice of the River, which I've quoted from here. Kenneth Douglas proved to be both a conman and a fraud (and possibly a bigamist)--by the fall of 1915, Marjory was persuaded to divorce him, and she moved to Miami, Florida, reunited with her father, whom she had not seen since her childhood. In Florida, Stoneman Douglas joined the staff of her father's newspaper. Frank Stoneman had gone to work for The Miami Evening Post, which had been purchased in 1910 and renamed the Miami Herald. Stoneman Douglas began her career in journalism as a society columnist, but soon her life changed once more. In 1917, the Herald arranged for Stoneman Douglas to meet and write a story about the first Florida woman to enlist in the U. S. Naval Reserve. Although the woman never showed up for her interview (or her enlistment), Stoneman Douglas still got the story, reporting to the Herald, "I got the story on the first woman to enlist. It turned out to be me." 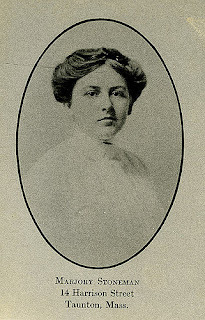 Stoneman Douglas served during from 1917 to 1918, but, not finding the routine much to her liking, she volunteered to serve in the American Red Cross. In her work in Europe, she traveled to France, England, Italy, Belgium, and the Balkans, reporting on conditions for war refugees. In addition to her writing, Marjory Stoneman Douglas became an activist. Proud of her family's abolitionist ties (she was related to the anti-slavery Coffin family), she was a charter member of the first chapter of the American Civil Liberties Union in the American south, and she worked to improve living conditions in racially segregated Coconut Grove. She was a supporter of the women's suffrage movement and of the Equal Rights Amendment. She was also a supporter of the Florida Rural Legal Services group, whose aim was protecting migrant laborers. Stoneman Douglas is best known today for her environmental work on behalf of the Florida Everglades, joining the fight to preserve the Everglades as a national park. In 1947, she published The Everglades: River of Grass, a work that "significantly impacted the environmental history of Florida by redefining the Everglades as a source of free flowing fresh water essential to both the people and wildlife of the region." 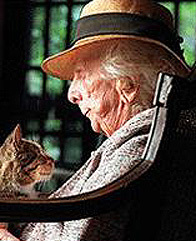 In her lifetime, Marjory Stoneman Douglas published news articles and editorials, short stories, a play, and non-fiction environmental writing. Works by and about her are available at the Internet Archive. 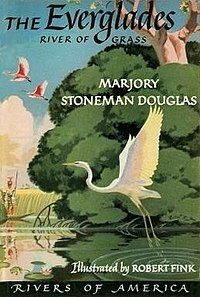 A useful bibliography is available at the Marjorie Stoneman Douglas: Writer and Conservationist website; you will find it by clicking here. This website also offers an incredible digital archive of Stoneman Douglas's papers, including book manuscripts, correspondence, photographs, diaries, newspaper articles, photographs, and correspondence. Marjory Stoneman Douglas is also a subject in Ken Burns's documentary series The National Parks: America's Best Idea. You can access a companion biographical essay, with links, by clicking here. I've learned a lot in these last few hours by reading about the life and work of Marjory Stoneman Douglas. Unfortunately, when you Google her name, what now comes up is link after link to a horrible mass shooting in Parkland, Florida. Many lives have been lost in yet another senseless tragedy--including that of Marjory Stoneman Douglas.